SYNTHESIS : (from tryptamine) A solution of 1.6 g tryptamine base in 10 mL isopropanol was treated with 5.1 g propyl iodide and 5.2 g diisopropylethyl amine, and stirred at room temperature for 36 h. The volatiles were removed under vacuum, and the residue was partitioned between CH2Cl2 and H2O made basic with NaOH. The organic phase was separated, the aqueous phase extracted with two additional portions of CH2Cl2, the extracts pooled and the solvent removed under vacuum. The residue, a fluid brown oil weighing 2.75 g, was treated with 5 g acetic anhydride and heated on the steam bath for 20 min. After cooling, a small amount of ammonium hydroxide was added, and the mixture added to 200 mL 0.5 N H2SO4. This aqueous solution was washed three times with CH2Cl2 and then made basic with 25% NaOH. This was extracted with 3x40 mL CH2Cl2, the extracts pooled, and the solvent removed under vacuum. The oily residue was distilled at 145-155 °C at 0.08 mm/Hg to give 1.14 g N,N-dipropyltryptamine base as a white oil. This was dissolved in 5 mL isopropanol, acidified with concentrated HCl, and diluted with 20 mL anhydrous Et2O to give N,N-dipropyltryptamine hydrochloride (DPT) as a fine white powder. The yield was 1.10 g (45%) with a mp of 174-176 °C. IR (in cm-1): 759, 774, 831, 987 (br. ), 1084, 1101. The replacement of the organic base diisopropylethyl amine with an equivalent amount of NaHCO3 yielded the same product but with a yield of less than 10%. (from indole) To a well stirred solution of 10 g indole in 150 mL anhydrous Et2O there was added, dropwise over the course of 30 min, a solution of 11 g oxalyl chloride in 150 mL anhydrous Et2O. Stirring was continued for an additional 15 min during which time there was the separation of indol-3-ylglyoxyl chloride. This intermediate was removed by filtration and used directly in the following step. This was added, in small increments, to 20 mL anhydrous dipropylamine which was being stirred. There was then added an excess of 2N HCl, the mixture cooled, and the resulting solids removed by filtration. These were recrystallized from aqueous EtOH to give, after air drying, 13.2 g indol-3-yl N,N-dipropylglyoxylamide with a mp 95-96 °C. A solution of 13 g indol-3-yl N,N-dipropylglyoxylamide in 350 mL anhydrous dioxane was added, slowly, to 19 g LAH in 350 mL dioxane which was well stirred and held at reflux temperature under an inert atmosphere. After the addition was complete, refluxing was maintained for an additional 16 h, the reaction mixture cooled, and the excess hydride destroyed by the cautious addition of wet dioxane. The formed solids were removed by filtration, washed with hot dioxane, the filtrate and washings combined, dried over anhydrous MgSO4, and the solvent removed under vacuum. The brownish residue was dissolved in anhydrous Et2O and saturated with anhydrous hydrogen chloride. The resulting crystals were recrystallized from benzene/methanol to give 11.9 g of N,N-dipropyltryptamine hydrochloride (DPT) with a mp of 178-179 °C and an overall yield of 49%. QUALITATIVE COMMENTS : (with 200 mg, orally) "This started sooner and was a lot stronger than I had expected. I had trouble talking and I felt very uncomfortable. I think physically I was in a chair but I was on a kind of mountain surrounded by clouds. And the clouds talked to me." (with 250 mg, orally) "I was seeing the Light real strongly. The Light sort of looked like bright bursts of Light but also like a kind of Spiritual Tunnel, and it seemed at one point, along with that, I saw a Human form, but the Vision seemed like I was sort of inside the Being and outside, and the Human was inside me and appeared to be outside, but I didn't see the being's face or clearly see the various limbs because the Being seemed to be the tunnel of Light that I was inside in the Vision, and seemed much larger than me. As King Jesus said: (St. John 6,56) 'Whoever eats my Flesh and drinks my Blood lives in me and I live in them'." (with 275 mg, orally) "I have smoked this amount one time some while ago, and this is a lot more interesting. And a lot more intense. With smoking, there was a body rush that was uncomfortable, and you never really know how much went into you, what with pyrolysis and all." (with 500 mg, orally) "This was intensely visual, and it lasted an exhausting 12 hours. I prefer the smoking route." (with 100 mg, smoked) "The entire experience lasted only 20 minutes. I found the visual experience to be everything. It was a lot more benign than mushrooms with pretty much no toxic things, more like mescaline." (with many mg, smoked) "I saw this vision of two hearts rotating. They were shaped like the usual heart shape (like a valentine). They filled most of my vision and were rotating one inside the other. Around the outside of the hearts there were sparkling jewels or crystals of light of different colors, maybe four rows deep surrounding them all around. This vision was totally clear. When I saw this vision, time was very full and long and complete." (with 80 mg, i.m.) "I feel light and nervous. I'm way off in a big castle with beautiful colors and scenery. I'm back with the girl who accused me of fathering her child. It's peaceful. She had everything she wanted. My aunt made sure we went to church on Sunday. I see the devil in front of my face. Everything is going fast. Too fast. It's not pleasant. Things are going zig-zag. Feels like I'm tired. I feel like an old man in a rocking chair sitting in front of a phonograph. Everything is so mixed up. I'm trying to get myself together. I have a vibrating feeling. It makes me feel as though I'm not here." (with 100 mg, i..m.) "I was being led by the hand of a wise old man who I know was God, and we went of to the front of the synagogue. I was handed a Torah for me to carry as a sign that I had been accepted, and forgiven, and that I had come home." (with 12 mg, i.v.) "We were using an i.v. drip with sodium ascorbate which affected the timing, of course. This was strong at this level. I was set to go to a target dosage of 60 milligrams, but decided to stop at 12. It was strong, real strong." (with 36 mg, i.v.) "This was administered as a sterile solution of the fumarate salt, so the actual weight of the drug used is somewhat less. This was a very intense experience, every bit as powerful as this amount of DMT." EXTENSIONS AND COMMENTARY : The earliest reports of human activity, at 1 mg/Kg, are mentioned under DMT. The clinical trials from which the 80 mg comment above was entered, were conducted on a population of physically sound alcoholics. It was not only a study to define the nature of action of DPT, but to challenge the idea that the metabolism of the dialkyltryptamine on the 6-hydroxyl position might give rise to active metabolites. This challenge was in the form of assaying 6-fluoro-N,N-diethyltrypamine in the same subjects, to see if it might be an active placebo. This is discussed under that specific compound, DET. Incidentally, the actual amount of DPT used was originally published as being 1.0 mg/Kg body weight, and I am guessing that the subject might have been of average weight, about 175 lbs. In these studies, dosages were taken up to as high as 1.3 mg/Kg, which resulted only in a prolongation, not an intensification, of effect. In all trials, the onset of effects occurred between 10 and 15 minutes following injection. Studies using lower dosages of DPT (15-30 mg intramuscularly) have been explored as adjuncts to psychotherapy with alcoholic patients. The enhancement of recall of memories and experiences, the greater emotional expressivenes and self-exploration, coupled with a consistently short duration, made the drug very attractive. Higher doses, up in the 100 milligram range, have been explored in psychotherapy, in the quest for peak experiences. Yet another study, in exploring the interaction of therapy counseling and DPT-induced peak experiences with patients who are dying, the i.m. dosage range was between 75 and 125 milligrams. There is a rather remarkable religious group known as the Temple of the True Inner Light, in New York City, which has embraced as its Eucharist DPT which they refer to as a powerful Angel of the Host. Their communion is confirmed by either the smoking or the drinking of the sacrament, and they have been totally unbothered by any agency of the Federal Government, as far as I know. It is not as if they were unknown. Quite on the contrary, I had on one occasion received a request for information on the drug from a reporter who was writing a story on DPT and its use in the church. I asked him just how he had gotten my name, and he told me that he was given it by someone within the DEA. Someone, sometime, should write an essay on contemporary religions, as to why DPT has flown, why peyote forever struggles, and LSD and marijuana have bombed out, when tied to religion. Is there something about a faith being an "approved" religion? Who gives his approval? Who decides the applicability of the first amendment which explicitly states that, "Congress shall make no law respecting an establishment of religion, or prohibiting the free exercise thereof." I wish the True Inner Light congregation Godspeed, if you will excuse the expression. My impressions of them from our correspondence have left me totally convinced of their integrity and dedication. It is an intriguing fact that this tryptamine was commercially available for a while from at least one small independent supplier of chemical novelties, but I believe that this is now no longer a valid source. 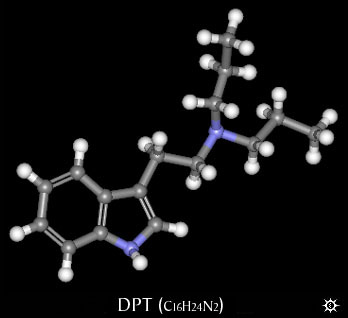 An intriguing (and perhaps theoretical) homologue of DPT is the 1-propyl counterpart, 1,N,N-tripropyltryptamine, referred to as PDPT. It is claimed that simply reacting tryptamine with an excess of propyl bromide put an alkyl group on the indolic 1-position (as stated also for the ethyl counterpart, sometimes referred to as EDET). In my own experiments with this reaction, I have yet to see any suggestion of 1-alkylation. The homologue with only one propyl group on the nitrogen, N-propyltryptamine or NPT, has been made according to the same recipe, and is discussed under NET.